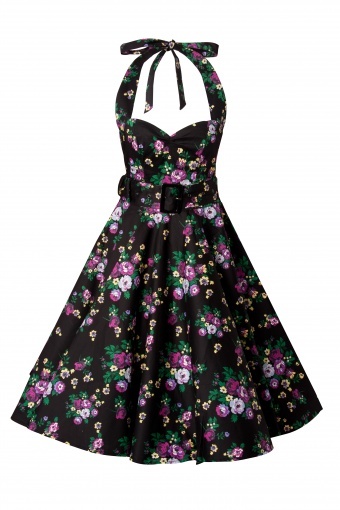 Fantastic 1950s style halter May Day swing dress black by Bunny. Besides the populair aaua coloured Mayday we now have it in black too! We love nothing more than authentic vintage prints, so we are always on the hunt for new ones to add to our collection. This beautiful halterneck dress is made from 98% and 2% spandex which gives a little stretch around the waist. 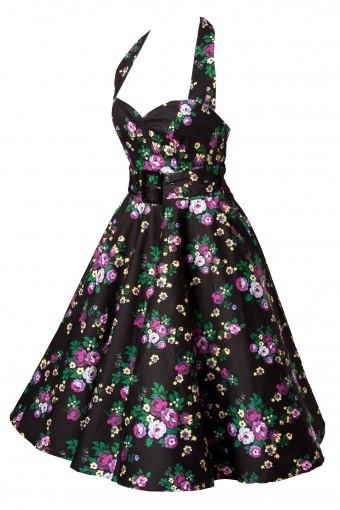 The cute floral pattern covers the entire dress over a black background. The halterneck ties are very long and drape nicely in a bow at the back. The removable waist has a belt with a large buckle and a zip up back. 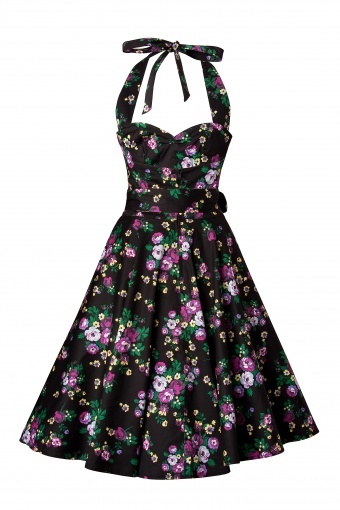 This 50s vintage style dress can also be worn with a petticoat underneath to add volume as shown on the pictures. Whether your tastes run to traditional fifties florals or wild novelty prints, we've something to suit everyone and every occasion, from parties to summer picnics.